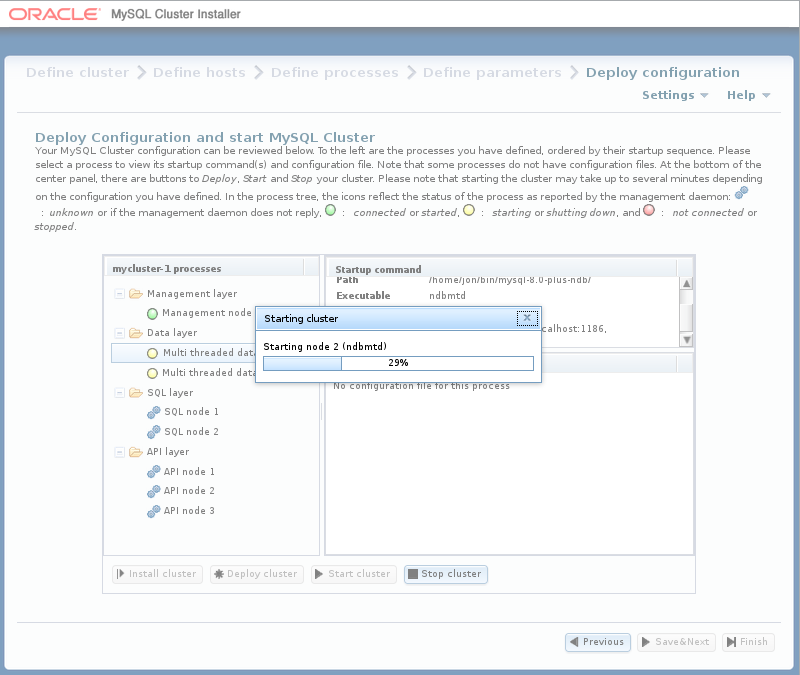 Welcome: Begin using the Auto-Installer by choosing either to configure a new NDB Cluster, or to continue configuring an existing one. 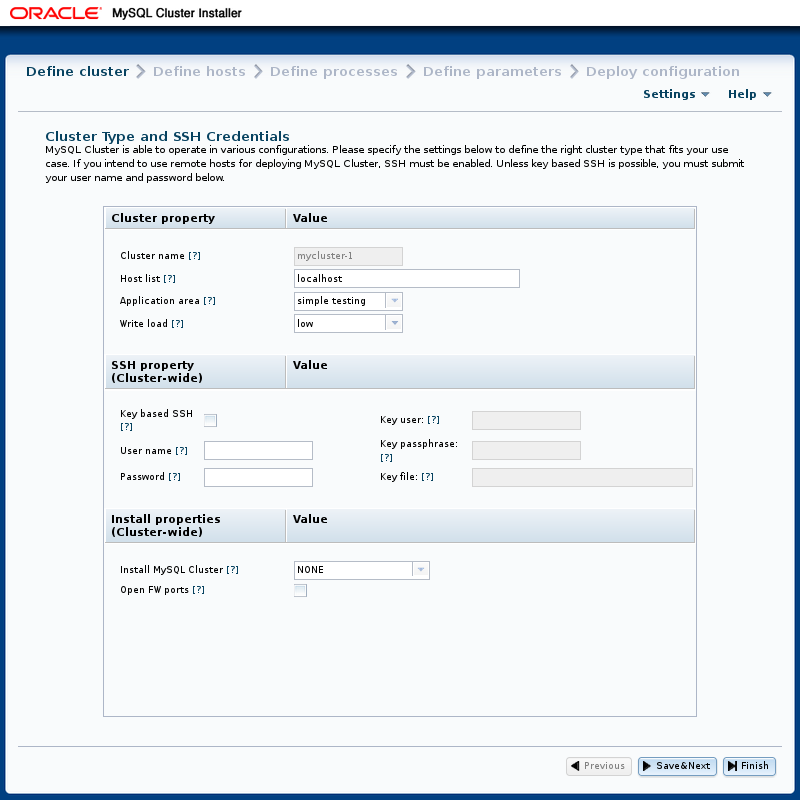 Define Cluster: Set basic information about the cluster as a whole, such as name, hosts, and load type. Here you can also set the SSH authentication type for accessing remote hosts, if needed. 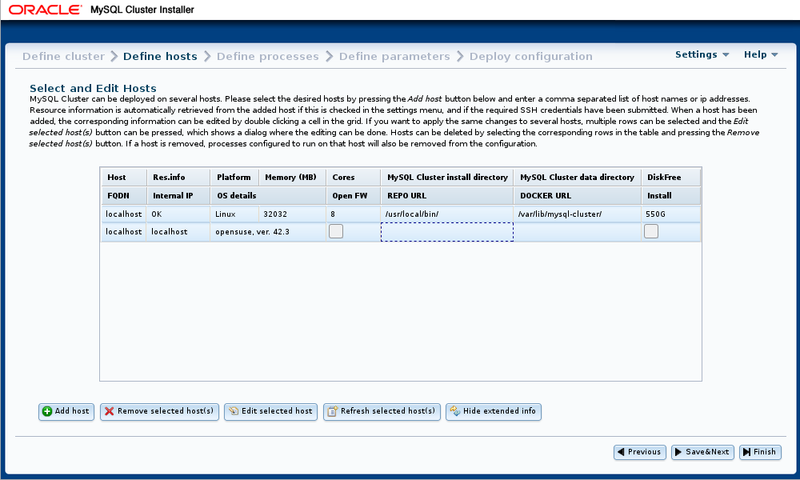 Define Hosts: Identify the hosts where you intend to run NDB Cluster processes. Define Processes: Assign one or more processes of a given type or types to each cluster host. Define Parameters: Set configuration attributes for processes or types of processes. 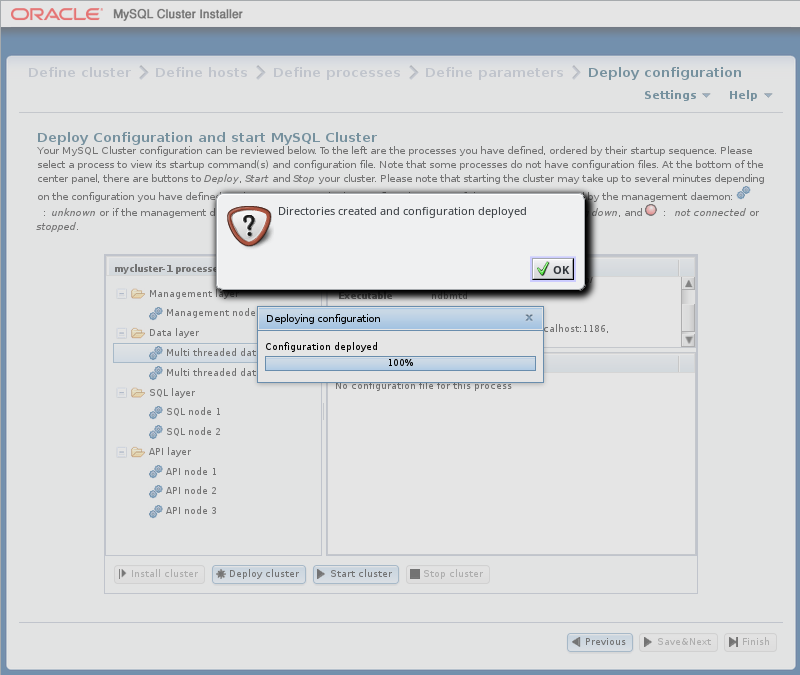 Deploy Configuration: Deploy the cluster with the configuration set previously; start and stop the deployed cluster. Automatically save configuration as cookies: Save your configuration information—such as host names, process data, and parameter values—as a cookie in the browser. When this option is chosen, all information except any SSH password is saved. This means that you can quit and restart the browser, and continue working on the same configuration from where you left off at the end of the previous session. This option is enabled by default. The SSH password is never saved; if you use one, you must supply it at the beginning of each new session. 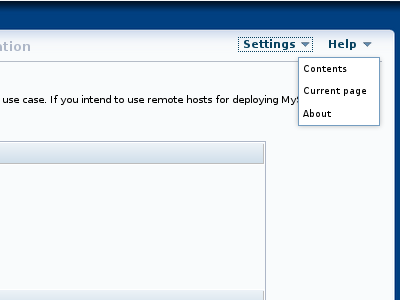 Show advanced configuration options: Shows by default advanced configuration parameters where available. Once set, the advanced parameters continue to be used in the configuration file until they are explicitly changed or reset. This is regardless of whether the advanced parameters are currently visible in the installer; in other words, disabling the menu item does not reset the values of any of these parameters. You can also toggle the display of advanced parameters for individual processes on the Define Parameters screen. Automatically get resource information for new hosts: Query new hosts automatically for hardware resource information to pre-populate a number of configuration options and values. In this case, the suggested values are not mandatory, but they are used unless explicitly changed using the appropriate editing options in the installer. Contents: Show the built-in user guide. This is opened in a separate browser window, so that it can be used simultaneously with the installer without interrupting workflow. Current page: Open the built-in user guide to the section describing the page currently displayed in the installer. 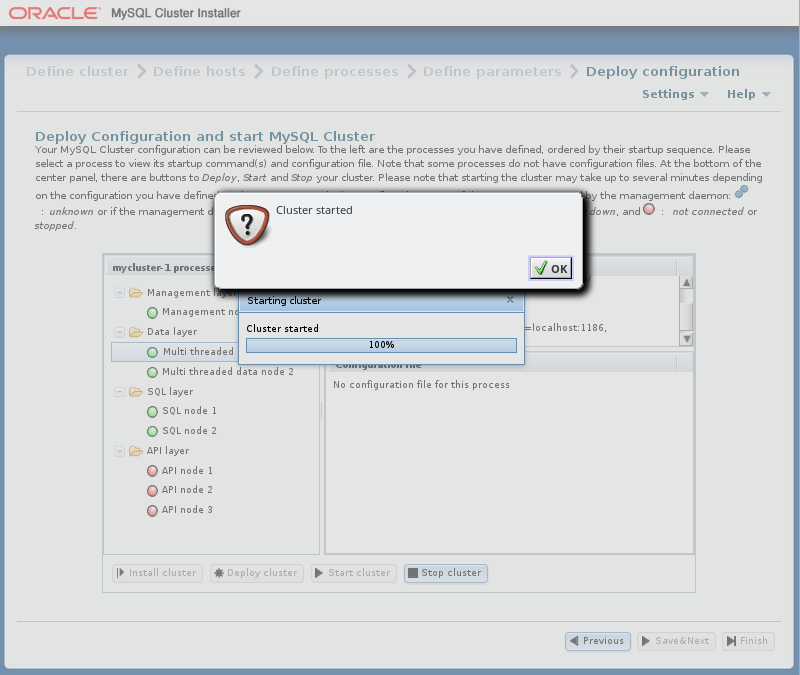 About: open a dialog displaying the installer name and the version number of the NDB Cluster distribution with which it was supplied. The Auto-Installer also provides context-sensitive help in the form of tooltips for most input widgets. In addition, the names of most NDB configuration parameters are linked to their descriptions in the online documentation. The documentation is displayed in a separate browser window. The next section discusses starting the Auto-Installer. The sections immediately following it describe in greater detail the purpose and function of each of these pages in the order listed previously. The present section explains how to start the installer. You can do by invoking the ndb_setup.py executable. You should run the ndb_setup.py as a normal user; no special privileges are needed to do so. You should not run this program as the mysql user, or using the system root or Administrator account; doing so may cause the installation to fail. ndb_setup.py is found in the bin within the NDB Cluster installation directory; a typical location might be /usr/local/mysql/bin on a Linux system or C:\Program Files\MySQL\MySQL Server 8.0\bin on a Windows system. This can vary according to where the NDB Cluster software is installed on your system, and the installation method. On Windows, you can also start the installer by running setup.bat in the NDB Cluster installation directory. When invoked from the command line, this batch file accepts the same options as ndb_setup.py. Press CTRL+C to stop web server. This works regardless of operating platform. Navigate to the NDB Cluster bin directory in a file browser (such as Windows Explorer on Windows, or Konqueror, Dolphin, or Nautilus on Linux) and activate (usually by double-clicking) the ndb_setup.py file icon. This works on Windows, and should work with most common Linux desktops as well. On Windows, you can also navigate to the NDB Cluster installation directory and activate the setup.bat file icon. In either case, once ndb_setup.py is invoked, the Auto-Installer's Welcome screen should open in the system's default web browser. If not, you should be able to open the page http://localhost:8081/welcome.html or https://localhost:8081/welcome.html manually in the browser. In some cases, you may wish to use non-default settings for the installer, such as specifying HTTPS for connections, or a different port for the Auto-Installer's included web server to run on, in which case you must invoke ndb_setup.py with one or more startup options with values overriding the necessary defaults. The same startup options can be used on Windows systems with the setup.bat file supplied for such platforms in the NDB Cluster software distribution. This can be done using the command line, but if you want or need to start the installer from a desktop or file browser while employing one or more of these options, it is also possible to create a script or batch file containing the proper invocation, then to double-click its file icon in the file browser to start the installer. (On Linux systems, you might also need to make the script file executable first.) If you plan to use the Auto-Installer from a remote host, you should start using the -S option. For information about this and other advanced startup options for the NDB Cluster Auto-Installer, see Section 22.4.26, “ndb_setup.py — Start browser-based Auto-Installer for NDB Cluster”. In this case, the only choice of cluster listed is for configuration of a new cluster, and both the View Cfg and Continue buttons are inactive. To create a new configuration, enter and confirm a passphrase in the text boxes provided. When this has been done, you can click Continue to proceed to the Define Cluster screen where you can assign a name to the new cluster. To view the configuration for and work with a given cluster, select the radiobutton next to its name in the list, then enter and confirm the passphrase that was used to create it. 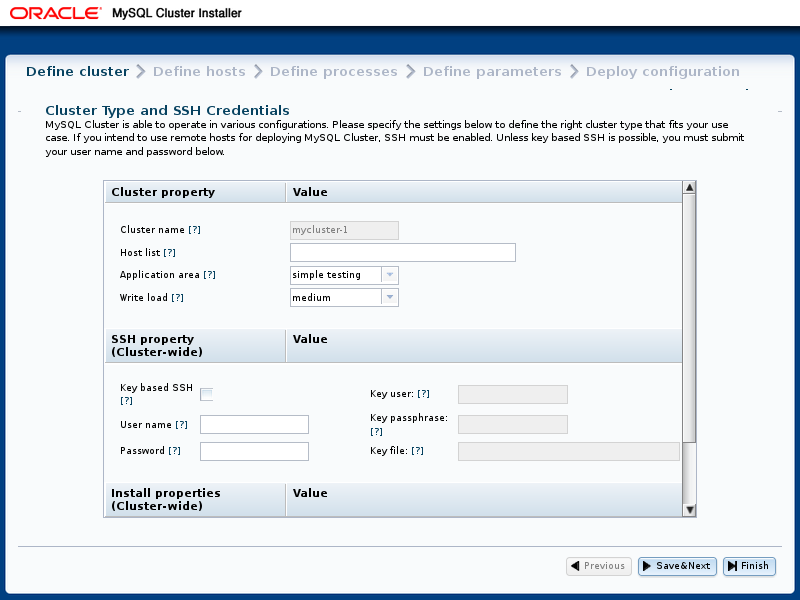 When you have done this correctly, you can click View Cfg to view and edit this cluster's configuration. This screen and subsequent screens also include Settings and Help menus which are described later in this section; see NDB Cluster Installer Settings and Help Menus. The Define Cluster screen allows you to set three sorts of properties for the cluster: cluster properties, SSH properties, and installation properties. 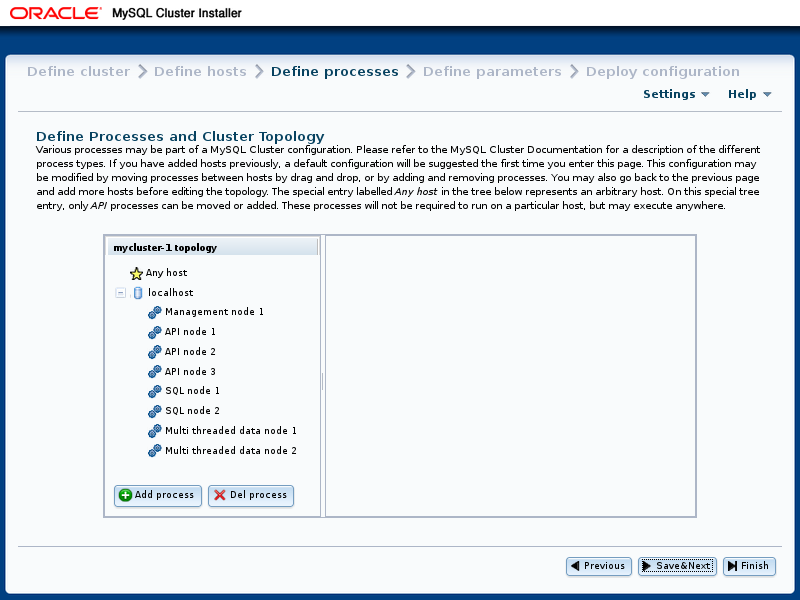 Cluster name: A name that identifies the cluster; in this example, this is mycluster-1. The name is set on the previous screen and cannot be changed here. Host list: A comma-delimited list of one or more hosts where cluster processes should run. By default, this is 127.0.0.1. If you add remote hosts to the list, you must be able to connect to them using the credentials supplied as SSH properties. Simple testing: Minimal resource usage for small-scale testing. This the default. Not intended for production environments. Web: Maximize performance for the given hardware. Real-time: Maximize performance while maximizing sensitivity to timeouts in order to minimize the time needed to detect failed cluster processes. Low: The expected load includes fewer than 100 write transactions for second. Medium: The expected load includes 100 to 1000 write transactions per second; this is the default. High: The expected load includes more than 1000 write transactions per second. Key-Based SSH: Check this box to use key-enabled login to the remote host. If checked, the key user and passphrase must also be supplied; otherwise, a user and password for a remote login account are needed. User: Name of user with remote login access. Password: Password for remote user. Key user: Name of the user for whom the key is valid, if not the same as the operating system user. Key passphrase: Passphrase for the key, if required. Key file: Path to the key file. The default is ~/.ssh/id_rsa. The SSH properties set on this page apply to all hosts in the cluster. They can be overridden for a given host by editing that hosts's properties on the Define Hosts screen. Open FW Ports: Check this checkbox to have the installer attempt to open ports required by NDB CLuster processes on all hosts. After making the desired settings, you can save them to the configuration file and proceed to the Define Hosts screen by clicking the Save & Next button. If you exit the installer without saving, no changes are made to the configuration file. 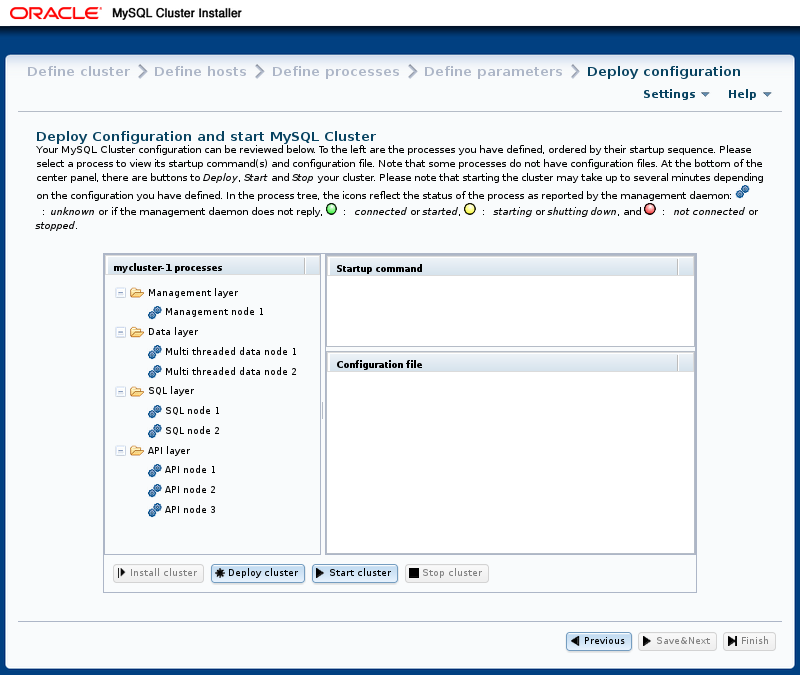 MySQL Cluster data directory: Path to directory used for data by NDB Cluster processes on this host; defaults to /var/lib/mysql-cluster. For hosts with multiple disks, only the space available on the disk used for the data directory is shown. FDQN: This host's fully qualified domain name, used by the installer to connect with it, distribute configuration information to it, and start and stop cluster processes on it. Internal IP: The IP address used for communication with cluster processes running on this host by processes running elsewhere. OS Details: Detailed operating system name and version information. Open FW: If this checkbox is enabled, the installer attempts to open ports in the host's firewall needed by cluster processes. 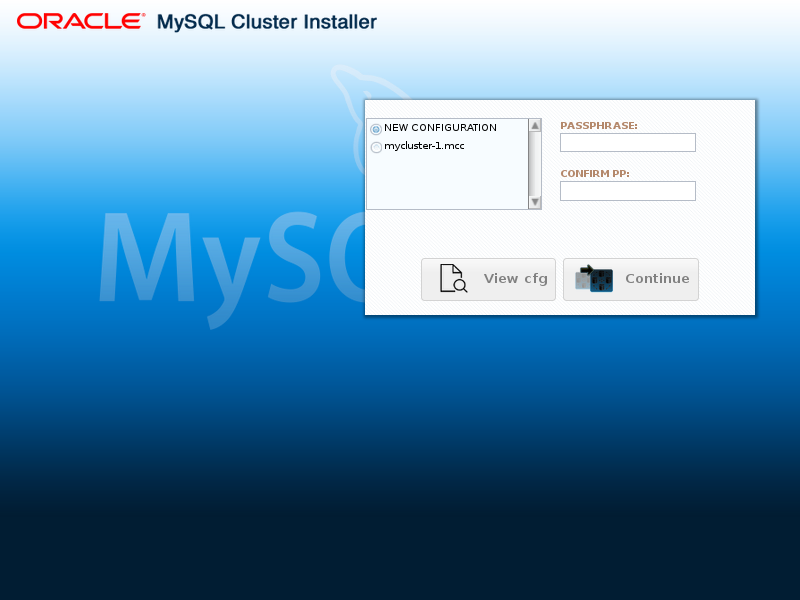 DOCKER URL: URL for MySQL NDB CLuster Docker images; for NDB 8.0, this is mysql/mysql-cluster:8.0. All cells in the display are editable, with the exceptions of those in the Host, Res.info, and FQDN columns. Be aware that it may take some time for information to be retrieved from remote hosts. Fields for which no value could be retrieved are indicated with an ellipsis (…). You can retry the fetching of resource information from one or more hosts by selecting the hosts in the list and then clicking the Refresh selected host(s) button. Host name: A comma-separated list of one or more host names, IP addresses, or both. These must be accessible from the host where the Auto-Installer is running. Host internal IP (VPN): If you are setting up the cluster to run on a VPN or other internal network, enter the IP address or addresses used for contact by cluster nodes on other hosts. Key-based auth: If checked, enables key-based authentication. You can enter any additional needed information in the User, Passphrase, and Key file fields. Ordinary login: If accessing this host using a password-based login, enter the appropriate information in the User and Password fields. Open FW ports: Selecting this checkbox allows the installer try opening any ports needed by cluster processes in this host's firewall. 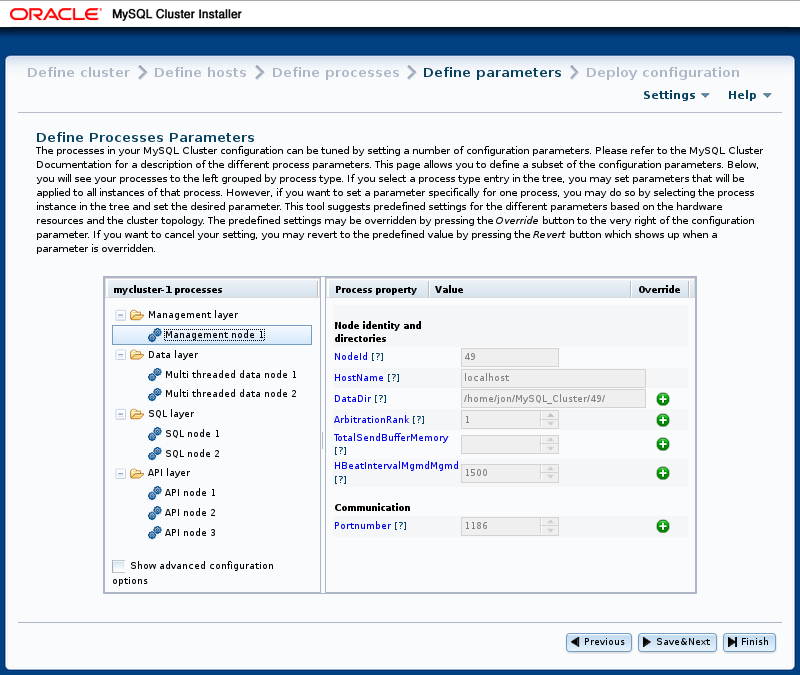 Configure installation: Checking this allows the Auto-Install to attempt to set up the NDB Cluster software on this host. To save the new host and its properties, click Add. If you wish to cancel without saving any changes, click Cancel instead. 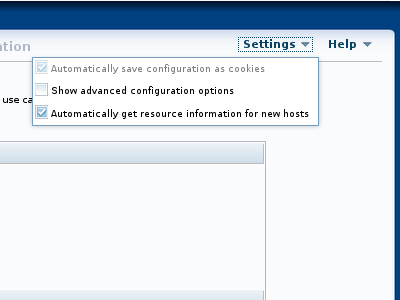 Similarly, you can remove one or more hosts using the button labelled Remove selected host(s). When you remove a host, any process which was configured for that host is also removed. Remove selected host(s) acts immediately. There is no confirmation dialog. If you remove a host in error, you must re-enter its name and properties manually using Add host. If the SSH user credentials on the Define Cluster screen are changed, the Auto-Installer attempts to refresh the resource information from any hosts for which information is missing. When more than one host is selected, any edited values are applied to all selected hosts. Once you have entered all desired host information, you can use the Save & Next button to save the information to the cluster's configuration file and proceed to the Define Processes screen, where you can set up NDB Cluster processes on one or more hosts. This screen contains a process tree showing cluster hosts and processes set up to run on each one, as well as a panel which displays information about the item currently selected in the tree. 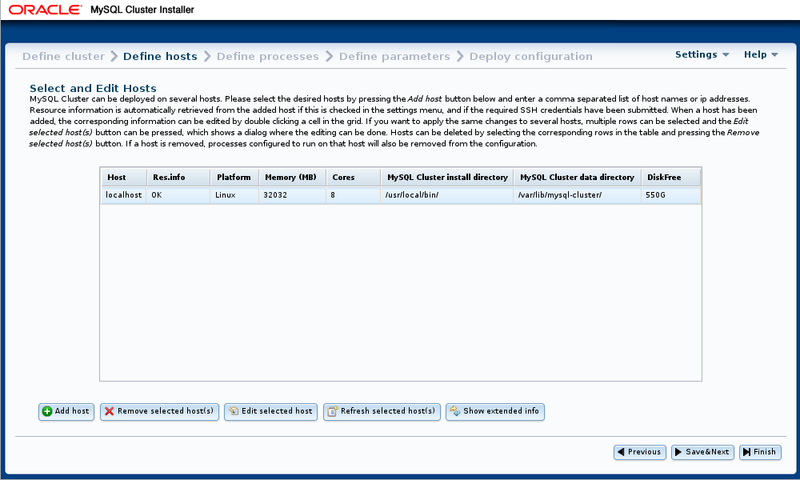 When this screen is accessed for the first time for a given cluster, a default set of processes is defined for you, based on the number of hosts. If you later return to the Define Hosts screen, remove all hosts, and add new hosts, this also causes a new default set of processes to be defined. Management node. Performs administrative tasks such as stopping individual data nodes, querying node and cluster status, and making backups. Executable: ndb_mgmd. Single-threaded data node. Stores data and executes queries. Executable: ndbd. Multi threaded data node. Stores data and executes queries with multiple worker threads executing in parallel. Executable: ndbmtd. SQL node. MySQL server for executing SQL queries against NDB. Executable: mysqld. API node. A client accessing data in NDB by means of the NDB API or other low-level client API, rather than by using SQL. See MySQL NDB Cluster API Developer Guide, for more information. For more information about process (node) types, see Section 22.1.1, “NDB Cluster Core Concepts”. Processes shown in the tree are numbered sequentially by type, for each host—for example, SQL node 1, SQL node 2, and so on—to simplify identification. Each management node, data node, or SQL process must be assigned to a specific host, and is not allowed to run on any other host. An API node may be assigned to a single host, but this is not required. Instead, you can assign it to the special Any host entry which the tree also contains in addition to any other hosts, and which acts as a placeholder for processes that are allowed to run on any host. Only API processes may use this Any host entry. Here you can select from among the available process types described earlier this section; you can also enter an arbitrary process name to take the place of the suggested value, if desired. Removing processes. 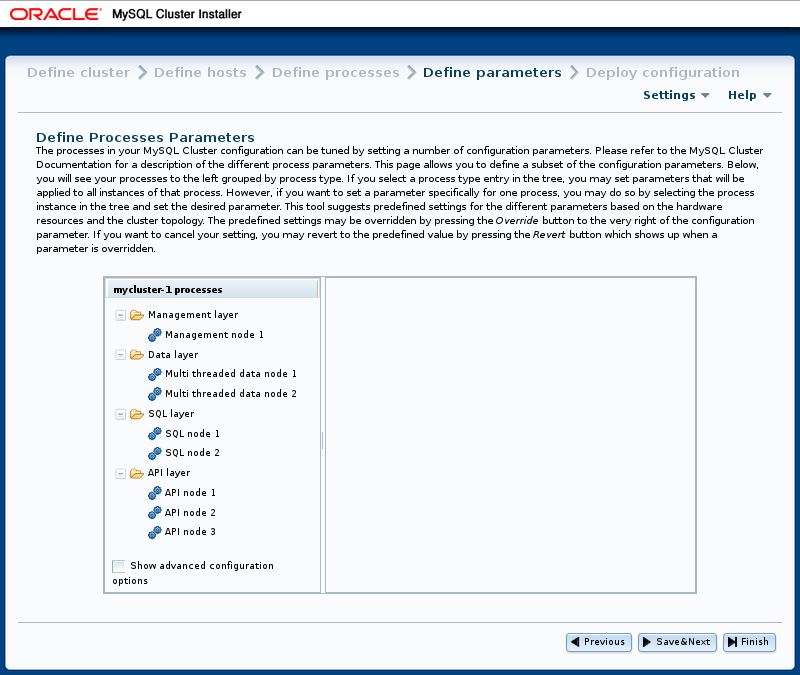 To delete a process, select that process in the tree and use the Del process button. When you select a process in the process tree, information about that process is displayed in the information panel, where you can change the process name and possibly its type. You can change a multi-threaded data node (ndbmtd) to a single-threaded data node (ndbd), or the reverse, only; no other process type changes are allowed. If you want to make a change between any other process types, you must delete the original process first, then add a new process of the desired type. The checkbox labelled Show advanced configuration, when checked, makes advanced options for data node and SQL node processes visible in the information pane. These options are set and used whether or not they are visible. You can also enable this behavior globally by checking Show advanced configuration options under Settings (see NDB Cluster Installer Settings and Help Menus). Attributes whose values can be overridden are shown in the information panel with a button bearing a plus sign. This + button activates an input widget for the attribute, enabling you to change its value. When the value has been overridden, this button changes into a button showing an X. The X button undoes any changes made to a given attribute, which immediately reverts to the predefined value. All configuration attributes have predefined values calculated by the installer, based such factors as host name, node ID, node type, and so on. In most cases, these values may be left as they are. If you are not familiar with it already, it is highly recommended that you read the applicable documentation before making changes to any of the attribute values. To make finding this information easier, each attribute name shown in the information panel is linked to its description in the online NDB Cluster documentation. Like the Define Parameters screen, this screen features a process tree which is organized by process type. Next to each process in the tree is a status icon indicating the current status of the process: connected (CONNECTED), starting (STARTING), running (STARTED), stopping (STOPPING), or disconnected (NO_CONTACT). The icon shows green if the process is connected or running; yellow if it is starting or stopping; red if the process is stopped or cannot be contacted by the management server. This screen also contains two information panels, one showing the startup command or commands needed to start the selected process. (For some processes, more than one command may be required—for example, if initialization is necessary.) The other panel shows the contents of the configuration file, if any, for the given process. 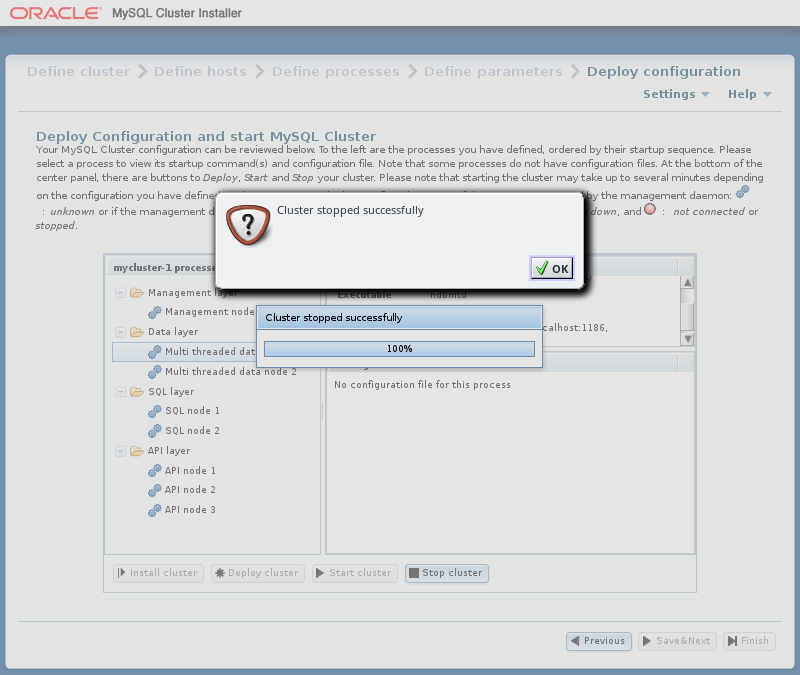 Install cluster: Nonfunctional in this release; implementation intended for a future release. 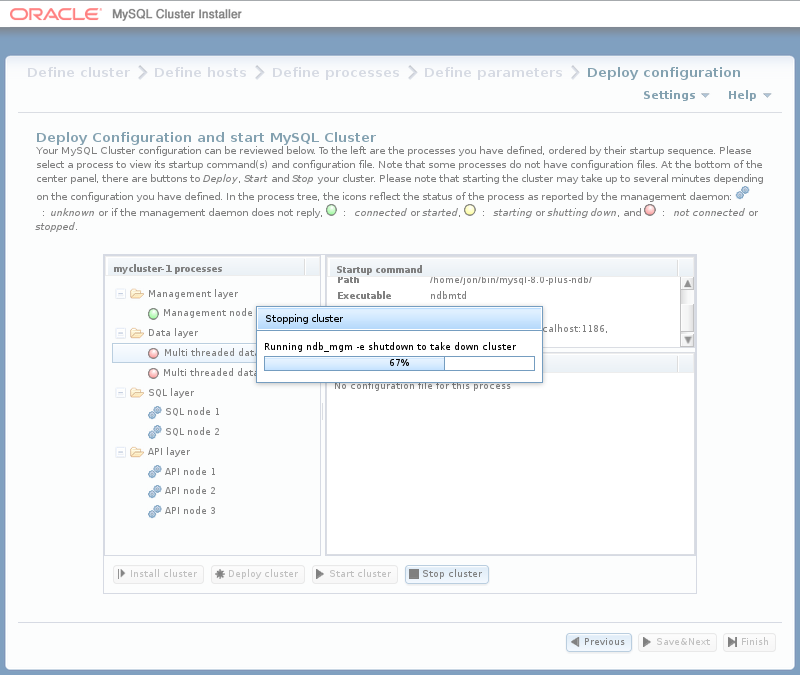 Start cluster: The cluster is deployed as with Deploy cluster, after which all cluster processes are started in the correct order. The process status icons next to the items shown in the process tree also update with the status of each process. The Auto-Installer generates a config.ini file containing NDB node parameters for each management node, as well as a my.cnf file containing the appropriate options for each mysqld process in the cluster. No configuration files are created for data nodes or API nodes.